While paving asphalt in the south Texas heat, Duke Cannon longs for two things: a cold beverage and a blast chiller of a shower. 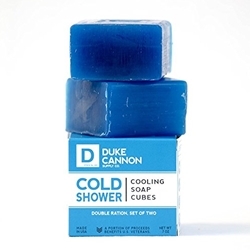 Built with a unique formula containing mint and menthol, these soap cubes provide a cooling effect that helps you recover after 16-hour work days, not 45-minute tennis lessons. Each box contains two (2) cooling soap cubes made of glycerin with a cool mint scent.